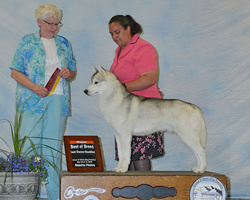 We started showing AKC Conformation in 2010 and currently have 2 AKC Champions on the roster. Keegan, who was our first exclusively Owner-Handled CH is well on his way to earning his Grand Champion title as well as earning his INT Championship during the spring of 2015. We are looking forward to expanding our show titles in the coming years. Each dog is presented to a judge is exhibited by the owner, breeder, or a hired professional. Most dogs in competition at conformation shows are competing for points toward their AKC championships. It takes fifteen points, including two majors (wins of three, four or five points) awarded by at least three different judges, to become an American Kennel Club "Champion of Record." The number of championship points awarded at a show varies depending on the number of males and females of the breed actually in competition. The larger the entry, the greater the number of points a male or a female can win. The maximum number of points awarded to a dog at any show is 5 points. Males and females compete separately within their respective breeds, in seven regular classes. 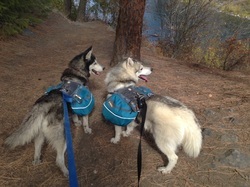 This is a part of the Siberian Husky Club of America's (SHCA) performance program that recognizes the achievements of Siberian Huskies participating in verifiable hiking trips as an active member of the hiking party. 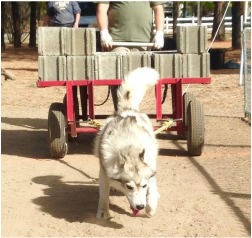 Siberian Huskies in this program may compete for two titles: Working Pack Dog (W.P.D.) and Working Pack Dog Excellent (W.P.D.X.). We are very excited to get out on the trails! The Siberian Husky travels a minimum of 40 total miles. At least two of the trips must cover a minimum of ten miles per day and no trip may cover less than five miles per day. Only one repeat hike of a trail is allowed. 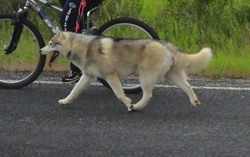 The Siberian Husky has previously been awarded the Working Pack Dog Title. A minimum of 120 miles additional pack miles are required to earn the Working Pack Dog Title. Multiple day pack trips and overnight camping are necessary. At least two of the trips must cover a minimum of 40 miles, and no more than one leg may cover less than 10 miles. The remaining trips must cover a minimum of 10 miles. All pack trips must be back country trips. Back country is defined as a remote area, inaccessible and unsuited to vehicular traffic at the time of the trip, where support and aid is generally not available. No repeat trips are allowed. Please include a copy of the WPD certificate in your application for the WPDX title. The sled/cart is started with some minimal weight. All dogs within a weight class pull this starting weight. An agreed upon weight increment is added, and all dogs pull again. There is an exception in that a handler may elect to skip one or two weights but no more than two as strategy or to conserve their dog's energy. This increment and everyone pulling continues, and at each weight one or more dogs may fail to pull. This continues until only one dog (or none) succeeds in pulling the current weight. The dog pulling the most is first, next most is second, etc. Ties are broken by the dog that pulls the weight the fastest. There are eight weight classes: 0-20, 21-40, 41-60, 61-80, 81-100, 101-125, 126-150, 151 and over. So the above is repeated for each weight class. Sometimes, there are very few dogs within a particular weight class, and classes will be combined. Even with this, the dogs still compete with only their weigh class. The pulling surface may be cleaned-up and graded between classes, but not during a class. Through the International Weight Pull Association (IWPA) Dakota, our old man, earned his Working Dog Title, placed in Silver two years in a row in the 60lb class Region 2, and earned a qualifying pull toward his Working Dog Excellence before his retirement from the sport in 2016. Denali finally got the hang of the sport in a new harness and earned a qualifying pull toward his Working Dog Title in the spring of 2015. Dog power has been used for hunting and travel for over a thousand years. As far back as the 10th century these dogs have contributed to human culture. Assembling a dog sled team involves picking leader dogs, point dogs, swing dogs, and wheel dogs. The lead dog is crucial so mushers take particular care of these dogs. Important too is to have powerful wheel dogs to pull the sled out from the snow. Point dogs (optional) are located behind the leader dogs, swing dogs between the point and wheel dogs, and team dogs are all other dogs in between the wheel and swing dogs and are selected for their endurance, strength and speed as part of the team. In dog sledding Siberian Huskies or Alaskan malamutes are the main types of dogs that are used for recreational sledding, because of their attractive looks and willingness to work. However, Alaskan Huskies are the most popular breed for sled dog racing, because of their endurance, good eating habits, speed, and dedication to running even when tired. We have just closed out our second season of dog sledding with our now 6 dog team! Rogue and Keegan will be joining the team in the next couple of seasons! See our Team Page for individual bios on our team dogs! What's the big difference between Dryland Dog Mushing and Traditional Dog Mushing? Dryland Mushing is not dependent on snow, while Traditional Mushing is. Both of these sports involve using dogs to pull some form of vehicle, whether it be a sled, bike, scooter, or ATV. Dog “drivers” are still called Mushers. 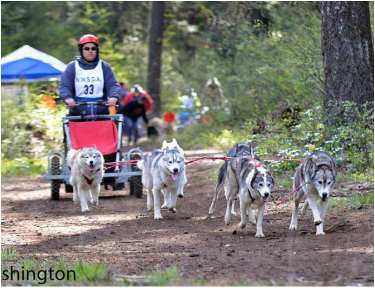 As well as driving the vehicle, Mushers are also dog trainers and caretakers. While there are races in both of these sports, traditional dog sledding has long endurance races as well as short sprint races that may only be a few miles long. Dryland races are usually only a few miles long. Dryland Dog Mushing is a relatively new sport in the United States, while Traditional Mushing's “Sled Dog Capital of the World” is located in the Alaska. In both of these events, purebred Siberian Huskies as well as mixed breed dogs are used in races. Many Dryland Dog Mushers are just in the sport to have fun and conditioning of their dogs for the winter season. Although Traditional Mushing and Dryland Mushing have many differences, the one main similarity is that Mushers at any level just want to have a good time with their dogs. We added a second dog cart to our training arsenal! Now training/racing on a 4-wheeled Fritz Dyck cart and running in the 6 dog classes! Check out our Team Page to meet our outstanding members and watch for updates and changes!